- Plug Cable Length: 1.5m. - USB Type: USB 3.0. - Weight: 305 g/10.76 oz. 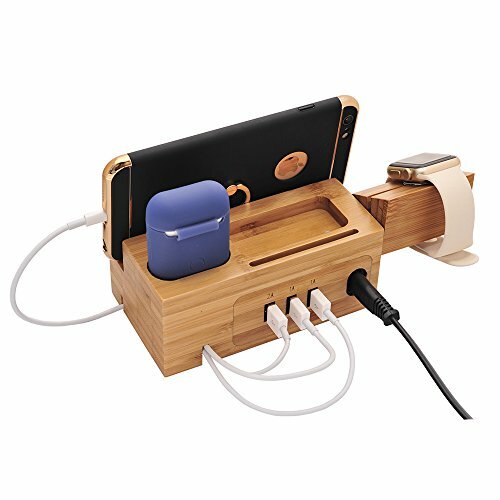 Update design, enlarged the internal cable storage compartment of the base, can place more cords inside, and coming with a magnetic cover which can cover the storage space to prevent the cords from coming out. Eco-friendly Material: Product made of natural Bamboo gives your Apple members gentle protection, there are silicon pads on the bottom against slip and not scratched the surface which place it. If you have any questions about this product by BoxThink, contact us by completing and submitting the form below. If you are looking for a specif part number, please include it with your message.